Summary: In this story of an extended teacher research project, the author shares the design, purpose, and impact of a course called “Drama and Inquiry,” where she and her students explored multiple perspectives, shifting identities, and ethical dialogue through their study of non-canonical plays including “The Laramie Project.” Consider including this article in an advanced institute to support conversations about teacher inquiry and social justice. While I had previously studied the impact that writing original plays had on my high school students, I had not looked closely at the impact that reading and performing the plays of others could have on them. 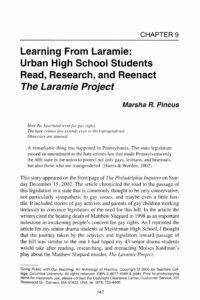 I had been planning to teach The Laramie Project to my drama classes. I was familiar with reader-response theory, particularly Rosenblatt’s (1995) ideas about the relationship between efferent and aesthetic responses to literature. These ideas intrigued me and raised questions about the ways in which my students would respond to this play. Because the play was about homosexuality, homophobia, murder, and religion, I knew that they would have deep emotional responses to the text. I was less certain how they would relate to the text intellectually and what my role as the teacher in this process should be. In addition, I had planned to have my students perform parts of this play for an audience. I was not certain how that process would affect their responses to the text.